The four Distinguished Graduates for 2017. From left to right: Jason Fraley, Chris Rich, Jeff Musselman, and Laura Allnutt MacIvor. 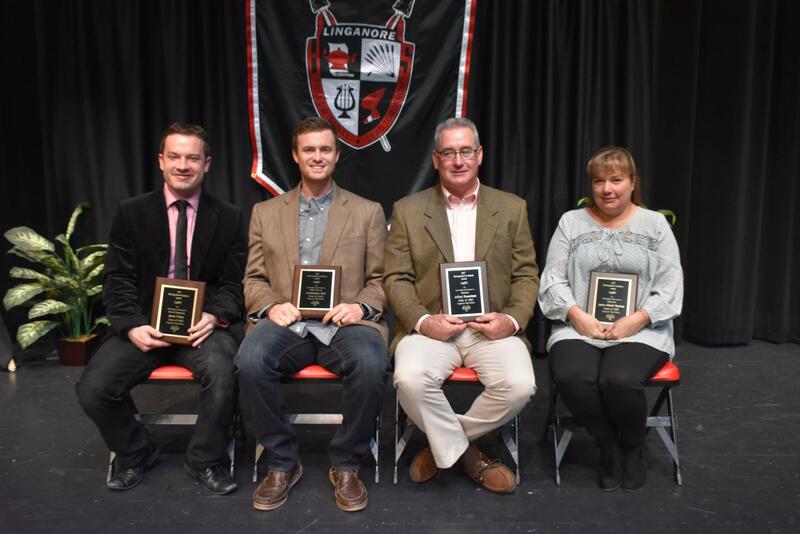 On November 21, the Distinguished Graduate Organization honored four graduates at the 16th annual ceremony at an assembly for the Class of 2021. Laura Allnutt MacIvor is the Academic Honoree. She graduated in 1985 and is now a science teacher at South Carroll High School in Carroll County. Business Honoree Jeff Musselman, Class of 1983, was recognized for his local excavating business. Chris Rich, the Pennsylvania Director for the Fellowship of Christian Athletes, was recognized for Public Service. He graduated in 2006. Jason Fraley, a radio entertainment reporter for WTOP, was honored for Arts & Humanities. In addition to awards and short speeches, the LHS Brass Ensemble and the Concert Choir performed. Participating members of the Class of 2021 were also speakers in the ceremony: Brady Domroe, Lexi Cioffi, Adam Liston, Elizabeth Rajnik, Jacob Fox, Lindsay Smith, Nick Condrasky, Danielle Hobbs. Following the ceremony, the honorees spoke in different classrooms. For example, Fraley visited his old “stomping grounds,” the journalism classroom, where he was editor. The Learning Commons was closed throughout the day to host a luncheon for the honorees and their guests. Mr. Jeremy Brown and the DGO committee organized the program and the day. If you know of an LHS graduate who has become a success and you would like to nominate him or her, please contact Jeremy Brown ([email protected]). 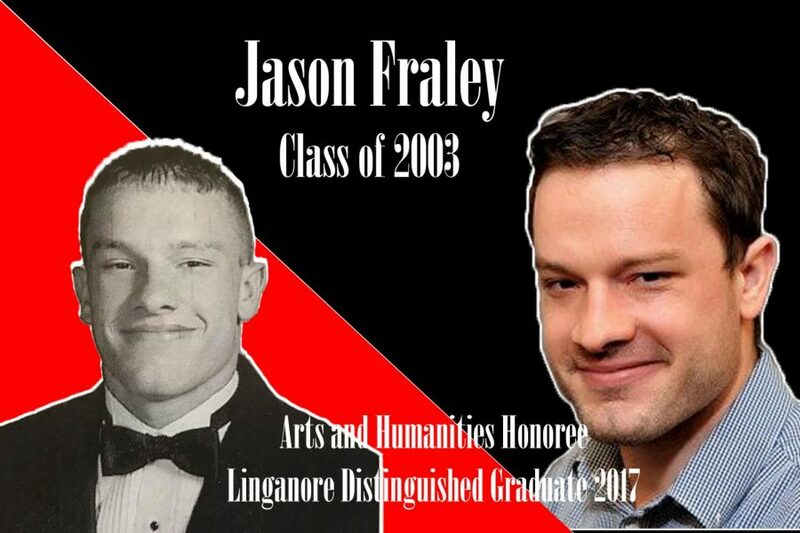 Class of 2003’s Jason Fraley can name any Oscar nominee or winning film of any year from the 1940’s to the present. During the 2017 Distinguished Graduate assembly, Fraley received the Arts & Humanities award. Fraley works as an entertainment critic for WTOP. Fraley has been a journalist at WTOP News since 2008 and a film critic since 2011. He keeps up with movies, theaters, and concerts. On Fridays, Fraley goes on TV on NBC4 and does previews for entertainment events around D.C. for the weekend. “I love my job because I never feel like I am going to work a day in my life,” said Fraley. After the ceremony, class visits, and luncheon, Fraley visited with Coach Conner, who was getting ready for state football competition. Coach and Fraley reminisced about the 2003 run for the state title, which, ironically, started Fraley’s journalism journey. During his speech, Fraley told a story from when he was a football player during his high school career. After losing the state game, a reporter from the Frederick News Post interviewed him, asked him about writing for The Lance, and offered him an internship at the Frederick News Post. During his speech, Fraley reflected on the impact Linganore had on his pursuit of his career. 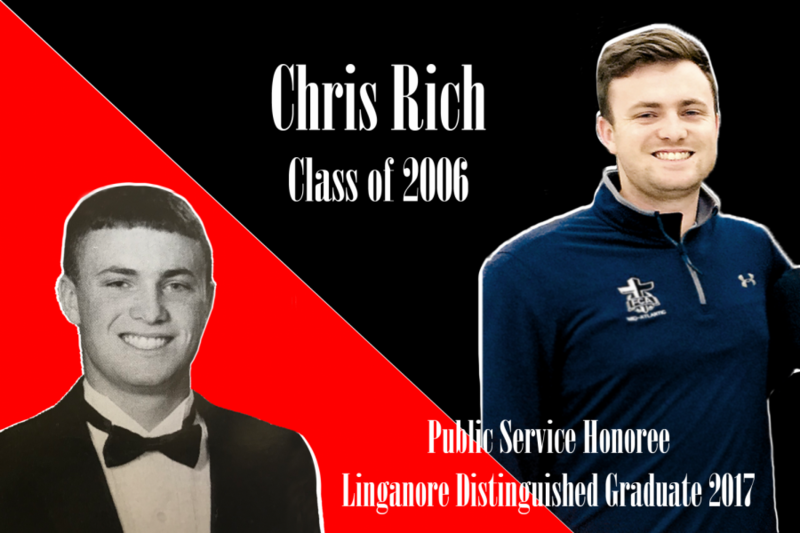 Chris Rich, a 2006 Linganore graduate, is the 2017 Distinguished Graduate honoree in Public Service. Rich was a four sport athlete while in high school, including football, basketball, track and field and tennis. His love for sports has helped to shape his career working with the Fellowship of Christian Athletes, FCA. “I love sports, and, more than anything I love Jesus. So, the opportunity to combine the two and share with others these two passions is a perfect fit for me!” said Rich. After graduating from Grove City College in 2010, with a degree in Biblical and Religious studies and a minor in Communications, Rich went on to become the FCA area representative for Frederick County until 2011 when he became the area director. Rich continued to move through the ranks with FCA. In 2014, he took on his current position as the first State Director for Pennsylvania. Rich is charged with the vision casting, fundraising and overseeing of the ministry in Pennsylvania. Rich never imagine working with FCA. He dreamed of catching touchdown passes for the Dallas Cowboys or making baskets for the Washington Wizards. “I always dreamed of being a professional athlete. I was a competitor with high aspirations. I now get the opportunity to work with professional athletes and I love what I do. I wouldn’t trade it,” said Rich. Rich speaks to a variety of different teams, ranging from NFL teams to middle school basketball leagues. During his times at Linganore, Rich was a member of National Honor Society and was Vice President for the class of 2006. Rich participated in Mr. Linganore in 2006 and came in second. Rich’s family is deeply involved in the community. His mom, Kathryn, and his brother, Michael, both work at Linganore. Michael is the offensive line coach for the varsity football team. Rich’s father, Roger, teaches business at Oakdale High School and is the JV football coach at Oakdale. His sister, Brittany, is a cosmetologist at A Do or Dye salon in Mt. Airy. Roger Rich is the pastor at Lakeview Church in New Market. Rich’s Parents are in charge of Impact Frederick, a week long mission to serve in the Frederick Community. Rich is married with two sons, a one year-old and a three year-old. “I have always looked up to him and he has always been a big role model in my life. He is always caring about other people and looking to serve others. He has shown me how to grow in my faith, how to treat people with love and kindness, and how to be a leader,” said Michael Rich. During Rich’s speech at the Distinguished Graduate Ceremony, he told the Class of 2021 that he cares about his legacy. Rich challenged the freshman to “leave a legacy” at Linganore. “I learned that I needed to take a stand and be bold. Not to just be tossed by the wind and what people think of you. In a lot of ways, I made mistakes and learned from them throughout high school,” said Rich. Rich said that while in high school, his only focus was football and that is how he decided his worth. After high school, he learned that that his worth shouldn’t be found in things. Rich ended his speech saying that he will always be a Linganore fan. 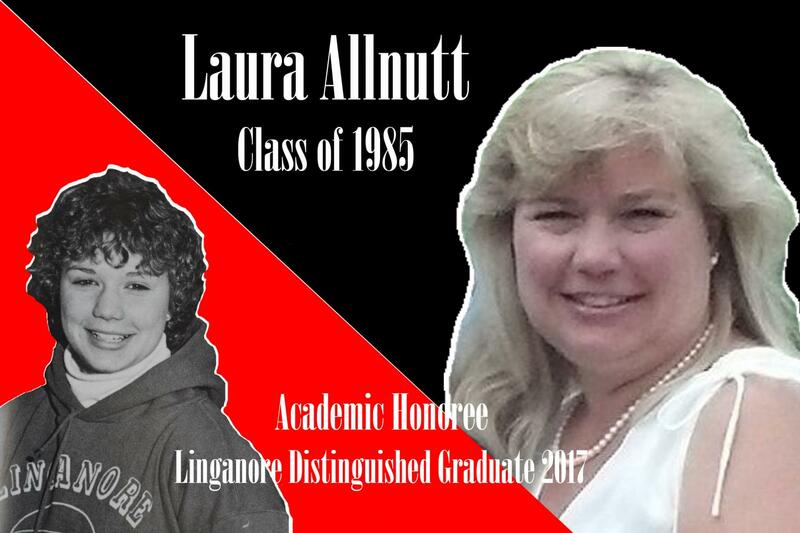 Laura Allnutt MacIvor, who is a Class of 1985 graduate, is the 2017 Distinguished Graduate Academic Honoree. She is a biology teacher and basketball coach at South Carroll High School in Carroll County, Maryland. MacIvor was very involved in high school. She played four years of field hockey, four years of basketball, three years of softball, and one year of track and field. Her family has always worked in schools, and being so involved in high school is what sparked her interest to teach that age group. After her high school career, she graduated from Shippensburg University. Her motivation to do well was always her parents. College classes were not always easy, but she was persistent. She admits that chemistry was a challenge, but she stuck with it, re-taking the courses that were most difficult. She continued to earn her Masters of Education at Western Maryland College (now McDaniel College in Westminster, Maryland). MacIvor knew this school would provide many opportunities for her future. “I learned that sometimes you have to work harder than you knew you could,” said MacIvor. “This award was an unexpected surprise. It was really nice to get back to Linganore and see how everything had changed,” said MacIvor. After the ceremony MacIvor visited a third period Earth/space science class and talked about events in her career that helped lead her to where she is now. “Ms. MacIvor shared some wise words of wisdom with us, which I will use during my years in high school, as well as when applying for my first job and beyond, “ said Ashley Walden, Class of 2021. MacIvor’s advice to current students is to get involved and do something during high school. “It makes the four years go by so fast and makes you want to be in school”, said MacIovor. Family is the most important thing to MacIvor. She knows her husband, children, parents, and siblings will always be there for her. Jeffrey (Jeff) Musselman graduated from Linganore in 1983, and is the 2017 Distinguished Graduate honoree in Business. “I felt extremely surprised, honored, and blessed when I found out I was being recognized as a Distinguished Graduate. I was actually very nervous about coming back to Linganore after 34 years. Public speaking has never been my strong suit,” Musselman said. He is the co-owner of his family business, Musselman Excavating Inc, an earth moving construction corporation located in Libertytown. They specialize in residential, commercial, and agricultural excavation, providing many services to Frederick, Montgomery, Howard, Carroll, and Washington County. “My sister and I were not surprised at all when we found out that our father received the Distinguished Graduate Award. He works so hard and he deserves this more than anyone else,” said Jeff’s daughter, Jessica Musselman. Both of Musselman’s children graduated from LHS also, and his other daughter, Jennifer, is the Office Manager at Musselman Excavating Inc. While at Linganore, Musselman participated in JV and Varsity football, JV and Varsity basketball, as well as Indoor & Outdoor track. He was also very involved in the Fellowship of Christian Athletes. The Musselman family has become a fixture at Linganore High School. There has been a Musselman at Linganore every decade since the 1960s. Musselman’s nephew, Ben, is currently a sophomore and plays running back on the varsity football team. His other nephew, Nathaniel, graduated in 2015 and currently plays football at Fairmont State University. “When I’m not working, I really enjoy outdoor activities like hiking, hunting, and fishing, as well as riding motorcycles,” he said about his life today. Musselman’s career history before co-owning his family’s company includes working at many excavating and construction companies based in Mt. Airy and Libertytown, where he took on the position of laborer, equipment operator, crew foreman, estimator, and project manager. He also served as a Deacon, Trustee, Finance Committee Member, and Building Committee Consultant for three years at Bush Creek Church of the Brethren in Monrovia, as well as a Nonmember Volunteer at the Libertytown Volunteer Fire Department for fifteen years.